It’s no secret that “Avatar” has been stunningly successful on nearly every front. The James Cameron-directed sci-fi epic is already the fourth-highest-grossing film of all time, having earned more than $1 billion around the globe in less than three weeks of theatrical release. The film also has garnered effusive praise from critics, who’ve been planting its flag on a variety of critics Top 10 lists. The 3-D trip to Pandora is also viewed as a veritable shoo-in for a best picture Oscar nomination when the academy announces its nominees on Feb. 2. But amid this avalanche of praise and popularity, guess who hates the movie? America’s prickly cadre of political conservatives. To say that the film has evoked a storm of ire on the right would be an understatement. 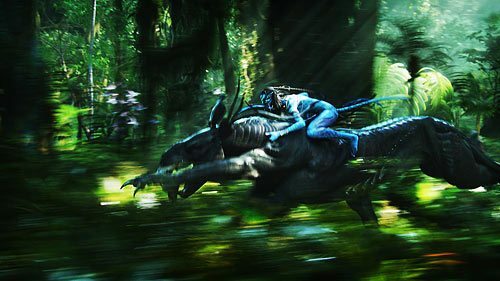 OB Rag blogger Doug Porter also did a review of Avatar. I heard these blue creatures practice withcraft with Harry Potter himself. Say what they will…personally, I feel no need to ever see another movie until more can be made just like this. Well worth the $14.50 admission price at the AMC Mission Valley 20. Oh yeah, let’s not forget the $7.50 popcorn ~ be sure to insist on your free refill for that price tag. This movie is the perfect heartfelt chick flick, an epic action edge-of-your-seat action guy movie, a powerful message about care of Mother Earth that we can simply no longer ignore on any level if we are to survive man’s destructive forces upon our rich planet; all in mind-blowing 3D as never seen before in cinematic history. A delicious theater experience if ever there was one. I say give J. Cameron all the Oscars and Golden Globes now and call it even.